Summary: The Sony a6000 is still the best value camera for surf photography, there are housings for all budgets and lenses for any type of surf photo. It’s hard to buy a bad camera these days, but taking surf photos you’re proud of is easier with the right camera, lenses, housing and accessories. I’ve personally used all of this recommended surf photography gear, so I’m confident that you’ll be getting a great piece of kit if you go for any of these products. I’m asked about surf photography gear a lot, and each person has a different set of needs and a different budget. This page will list the gear that I use and that I believe offers the best value for anyone wanting to shoot surf photography. I’ll try and present at least two options for the most popular types of gear you’ll need for surf photography. One will offer the best performance on a budget, and the other will offer better quality for a higher price. I’ll also explain which one I use myself. You’ll find lots of links to other pages on this site where I go into more detail on the items and how I use them. As always, if you’ve got a question about surf photography gear, or how to use it, send me an email at ben@learningsurfphotography.com and I’ll try and get back to you as soon as I can. This type of camera will be the best option for most surf photographers who want to take a variety of styles of photo. If you only want to take one type of photo, have a look at the bottom of this page for some more options. The best all round surf photography camera for anyone on a budget is the Sony a6000. This will be familiar to anyone who’s read any of my other recommended surf photography gear pages, as it’s always cropping up. I reckon it’s still a better option than even the latest Sony a6400 camera. It’s small, light, inexpensive and performs really well in all the areas that you need for surf photography. There are many different options for surf specific water housings to suit most budgets, and there are lenses from Sony and third party brands to suit any surf photography style. If you’re starting out, or coming from an older interchangeable lens camera set up, and you’re on a budget, don’t hesitate, go for the Sony a6000. I bought my first one in 2014 and it’s still going strong. I’ve been using the Sony a6500 for nearly a year, and if it’s within budget, it’s a better buy than the Sony a6000, but not by a huge margin. The most important specifications are basically the same as the Sony a6000, but it adds a much bigger buffer, 4K video recording, in body image stabilisation and better auto focus performance, in an only slightly bigger body. At the end of the day, there are very few shots you could take with the Sony a6500 that you couldn’t with the Sony a6000, but if you need 4K video, or you use the camera for other types of photography or video, then it’s a sensible upgrade. Lenses that cover the standard focal lengths most photographers use from day to day. 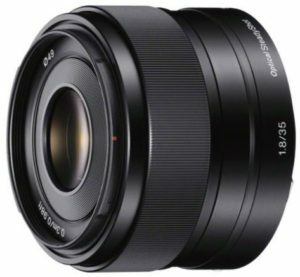 The kit lens for the a6xxx range of cameras, the Sony 16-50mm f3.5-5.6 OSS lens is supported by all the water housing manufacturers, it can get you great photos and has a decent zoom range in a tiny size. I have moved towards the fisheye or the 35mm focal lengths for the majority of my water shooting, but I’ve got some nice photos with this lens, and I use it all the time for shooting videos for my YouTube channel. I used the Sony 18-105mm f4 G OSS lens with my old DSLR housing which I adapted. If you want to shoot with this lens in the water you’ll need the Salty Surf Housings port for it, I don’t think anyone else makes a zoom port specifically for this lens, but you could probably find an old Aquatech port and use it with their ATB housing system if you hunted long enough. Any recommended surf photography gear page needs to mention fisheye lenses. If you want to shoot the classic inside the tube photo, you’ll need a fisheye lens. I like this very budget friendly rectangular fisheye, but you might struggle to find a dome port that will work with it, as it’s shorter than other fisheyes. 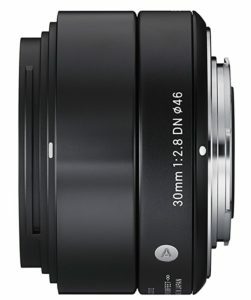 A great lens, and one that I’d recommend to anyone who wants a rectangular fisheye for their Sony a6xxx range camera. It’s the most widely supported by water housing manufacturers with nearly all of them offering a dome port that will work with this lens. There are two colours, silver and black, and also a V1 which is slightly shorter. 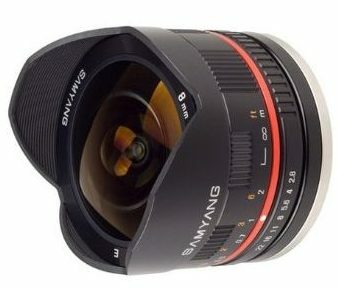 The lenses are branded as Samyang or Rokinon depending on where you are, but they’re the same lens. This is a great budget friendly option, giving you quality images with a couple of sacrifices. it doesn’t autofocus as well as a Sony lens, but I didn’t have any big issues with mine. It doesn’t have stabilisation built into the lens, which isn’t an issue with the Sony a6500 as it has stabilisation in the body, and for still photos it’s not really a problem for surf shots as you’ll be using a fast shutter speed anyway. I really like this lens. It’s small, has OSS built in which I find really useful for shooting video on the a6000, and a fast aperture, which helps in low light and when you want a shallow depth of field. 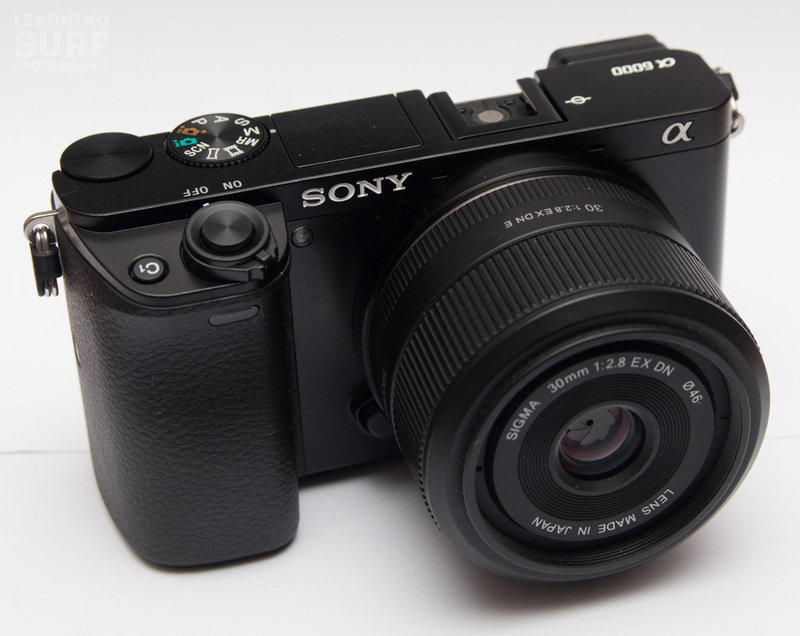 If you want something as close to a 50mm equivalent focal length, this is it for the sony a6xxx range. I always pack this lens for shooting in the water when I go on a trip, and it gets a lot of use on land for general photography too. When you’re shooting form the beach, you need a long lens. I value compactness and value in my lenses, but I’ve also tested some of the more expensive options to see what I’m missing out on. I’ve written a lot about his lens and teleconverter combo, so I recommend reading through the links below if you’re interested. This is a good value, compact, zoom lens that will allow you to take photos from the land at most surf spots. If you photograph spots that break a long way from the shore then you might want to look into getting a much longer lens (or a superzoom camera), but this will be the best option for most surf photographers. I rented this lens and made a video review to go with my blog post on it. If you’ve got the budget and need the best quality, this is the telephoto zoom to get for Sony e-mount. 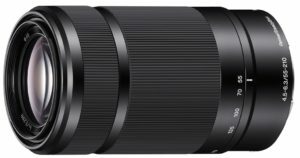 Personally I can’t justify the cost of this lens, and the 55-210mm plus teleconverter performs adequately for me at a fraction of the price and size. Watch my video here: Should you buy the Sony 100-400mm GM lens for surf photography? Waterproof your camera and lens. A surf water housing will offer options for interchangeable ports to accommodate different lenses, and some sort of pistol grip so you can shoot one handed, this is a big advantage when shooting photos in waves. I wouldn’t recommend a dive housing if your main aim is to take surf photos. My favourite water housing. Its small, light and very well designed to offer everything a surf photographer needs, and nothing they don’t. It will be a sad day when I finally give up my Sony a6000 and Liquid Eye C6000 housing, but I will definitely be getting another one for whatever camera I end up getting next. 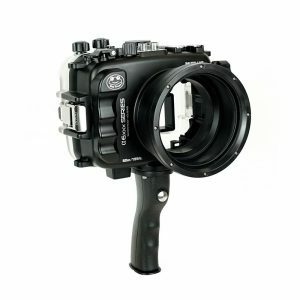 Their latest housing, the Liquid Eye C2060 supports several Sony cameras (with different back plates and accessories where needed), including the a6xxx range and the A7III and A9, which is a pretty future proof setup. I’m holding out until Sony release their next high end aps-c camera (if they don’t release another aps-c camera I’ll eventually go for full frame, but it’ll make me sad). The most inexpensive surf water housing available. There are some sacrifices, mostly that its a dive housing with an added pistol grip, so you aren’t getting a housing that’s designed for surf photography from the start. If you’re on a tight budget then this is a better choice than a standard dive housing, but if you can spare some more money, definitely look into something like the Liquid Eye C6xxx range. I#ve produced an online, video based course that goes through everything that I’ve learned in the last 10 years of surf photography. There’s a beginner friendly essentials course which will get you going quickly, and two options that include the full video content and extras. The Everything bundle has over 9 1/2 hours of video content featuring over 250 example photos, and the One-to-one course includes a portfolio review and personal video coaching and more. I’ll be adding more information on the courses’ content in the future. Sony 10-18mm f4 OSS – It’s a really useful lens for shooting inside or really wide line-up shots. If you don’t want to go for a fisheye then this is an alternative that offers a wide angle, but I prefer the look of a fisheye over this lens at 10mm, and would rather go for a cheaper, smaller, lighter, faster lens like the Sigma 19mm f2.8 at the long end. Sigma 16mm f1.4 – fantastic quality, and a really unique lens for the Sony e-mount cameras. The only port I have for shooting with this lens is the large 6″ dome port on the SeaFrogs Salted Line housing, so it’s a big, heavy setup when I shoot with this lens. I like the results, but found I prefer fisheye and 35mm in nearly every situation. Sigma 19mm f2.8 – a budget friendly lens, I got some great results with this lens, but ultimately I prefer shooting fisheye or 35mm over this one, so I wasn’t using it very much. Sony 30mm f3.5 macro – it was a fun experiment shooting with this lens, it can give you some unique shots using the close focusing to highlight the foreground. I found the focus too slow for action shots and the macro opportunities for surf photography are very limited. Sony 50mm f1.8 OSS – I really like this lens for surf photos in low light when you can sit close to the breaking waves. I haven’t included it in my recommendations above because I find it a bit of an awkward focal length, I prefer the 35mm for most situations, but it’s definitely a capable lens that can deliver good results. Sigma 60mm f2.8 – much like the Sony 50mm, but I think I prefer the slightly longer focal length of the 60mm. I’ve used this lens in tiny shorebreak waves and big reef break waves with a defined channel. It can work in lots of situations, but it’s more of a niche focal length than the 35mm. Tokina 10-17mm fisheye – fantastic, relatively inexpensive fisheye lens. I always shot at 10mm and got some of my favourite shots with this lens. Canon 10-18mm – a budget friendly wide angle, I only shot with it a couple of ties on a 7D and it worked fine, but I prefer the fisheye look personally. Canon 15mm fisheye – not great on a cropped sensor, I used it briefly on a 5D and was happy with the results. I also shot this lens on a 35mm film EOS camera body and it worked great. Canon 28mm f2.8 – At the time I loved it, but it was old and had a few quirks, I’d avoid it these days. Canon 50mm f1.8 – The nifty fifty was the first lens I shot with i the water and it worked well, it’s great value and a no brainer for anyone who;s got a Canon EOS camera who wants to step up from the kit lens. Canon 70-200mm f4 L – great lens, one of my all time favourites. I used it on aps-c EOS bodies as my lens for land shots. Salty Surf Housings – really well made aluminium housings from Australia. I’ve used their a6000 housing, but they make them for a large range of cameras. They offer the widest variety of ports. SPL a-series – I’ve used a couple of SPL housings with my older Canon DSLR cameras. They worked well. Dale Kobetich custom housing – I owned one for a Canon DSLR and it was a fantastic piece of engineering. There are reports of inconsistent customer service when buying a housing, so I’d do some research before trying to order one. Aquatech – I’ve used several different Aquatech housings and I liked them all. They make a high quality product and have the best network of dealers around the world by far, so you’re much more likely to be able to get your housing serviced, or buy additional accessories like ports, wherever you are in the world. If you’d like to know more about any of my recommended surf photography gear, or you’ve got a specific question about what’s best for you, email me at ben@learningsurfphotography.com and I’ll get back to you.